The identities who litter the Thoroughbred Club’s first 50 years have several common links notably, they love racing, they love horses and they love having fun. Decorated author and veteran journalist Rod Nicholson brings them to life in the 50th anniversary of the Thoroughbred Club’s commemorative book, Power And Passion of Racing Pals. The book traces the club’s first half century, seen through the eyes of its amazing cast of movers-and-shakers, comprising owners, breeders, trainers and jockeys, administrators, stewards, media and even priests. Many are no longer with us giants of the sport such as legendary trainer Bart Cummings and internationally-acclaimed jockeys Scobie Breasley and Roy Higgins, as well as media megastars Bill Collins and Ron Casey among them. However big names in the sport have permeated the club throughout the decades. Club members have won four Melbourne Cups in the past eight years and shared in 11 Caulfield Cup successes in 50 years. In fact, Gerry Ryan and Alan Green are looking for their third Melbourne Cup success with reigning favourite Yucatan. While owning, breeding, training or riding major race winners is part of the picture, the mandate of the club is to promote racing and to have a good time. Gala events are standard. Nicholson has embraced the membership, interviewing a host of members who candidly tell of their big wins, their embarrassing moments, the fun and frivolity of being part of the club. Thoroughbred president Cameron Fisher said the club had evolved into one of the most influential and respected promoters of racing in the racing. “This book encapsulates the rich history of the club, the vibrancy of the members and the overall love of racing within the ranks _ and will give everyone a lot of laughs,” he said. 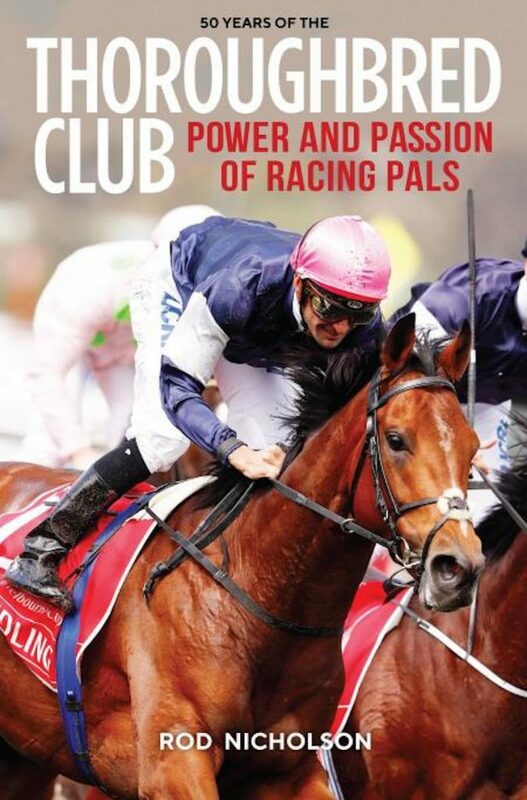 The 50th Years of the Thoroughbred Club, Power and Passion of Racing Pals, is available from TBC secretary Roger Jennings at vintage@alphalink.com.au or phone 0419373188. NEXT POST: Is Manhattan Rain going to Runaway with a Victorian bred Melbourne Cup?